A first-of-its-kind space mission shows dips in groundwater supplies globally. The winning design by Richard Vijgen in the World Water Day competition by HeadsUP! and Visualizing.org will be on display in New York City's Times Square for one month. Titled “Seasonal and Longterm Changes in Groundwater Levels,” Vijgen's design uses NASA's gravitational data. Taking billboard space among the corporate advertisements, bright neon signs, and iconic video screens of New York City’s Times Square, one of the busiest pedestrian intersections in the world, is a 30-second digital animation of the world’s groundwater. The electronic display — which won an international design competition to create a visualization related to world water issues and will run on two screens in Times Square through April 22 — conveys powerful climate, population, and economic trends affecting groundwater, which makes up more than one-fifth of the global fresh water. Places as disparate as North Africa, California’s Central Valley, and India’s northern states, among others, are all facing similar threats to their livelihoods, as climate patterns and resource-intensive ways of life are crashing into limits on groundwater supply. Much of the data behind this animation is part of efforts by scientists at the U.S. National Aeronautics and Space Administration (NASA) and the University of California, Irvine (UCI), to use the small gravitational variations in the Earth, caused primarily by the redistribution of water on and beneath the land’s surface, to track changes in groundwater levels around the world. This video shows that the winning design by Richard Vijgen in the World Water Day competition by HeadsUP! and Visualizing.org was not a stagnant image, but an animation based on NASA’s gravitational data on groundwater changes seasonally and annually. Since 2002, NASA and the German Aerospace Center’s Gravity Recovery and Climate Experiment mission, known as GRACE, has relied on two twin satellites that complete a full scan of the Earth each month, sending back some of the best data on the variations in the planet’s gravity fields. The program, researchers say, identifies the spots around the world where groundwater is disappearing or recovering, and the data could provide a potentially powerful new global tool to scientists, water managers, and policy makers as they try to anticipate the effects of climate change and rising populations on the world’s freshwater resources. Monthly variations of water storage in India from the NASA GRACE mission. In 2009, GRACE found big dips in northern India’s groundwater. Anomalies of water storage in California from GRACE relative to the November 2002-November 2008 mean. Satellite technology also allows scientists to track groundwater levels in areas of the world that don’t have monitoring wells or don’t share their data publicly. GRACE findings show that, since the late 1990s, the arid Central Valley has lost about 50 cubic kilometers (12 cubic miles) of groundwater, or 1.5 times the volume of Lake Mead, the largest man-made reservoir in the United States. In 2009, the mission also produced some of the first public data about the rate of groundwater depletion in India. GRACE observations found that beneath northern India’s irrigated fields of wheat, rice, and barley, and beneath the densely populated cities of Jaiphur and New Delhi, groundwater levels are declining by an average of one meter every three years (1 foot per year). Between 2002 and 2008, northern India lost more than 109 cubic kilometers (26 cubic miles) of groundwater — or triple the volume of Lake Mead — primarily to irrigate crops. Goddard scientists are also experimenting with a project that generates weekly U.S. national groundwater maps by combining long-term meteorological data and GRACE satellite observations. Researchers say that the maps could be used to monitor the health of critical groundwater resources, in addition distinguishing between short-term and long-term droughts. One of these maps showed that the severe drought that has been gripping Texas since October 2010, and that, as of November 2011, the drought had reduced groundwater throughout most of the state to the lowest levels in more than 60 years. Image courtesy of Jay Famiglietti, University of California, Irvine, and JPL/Caltech. 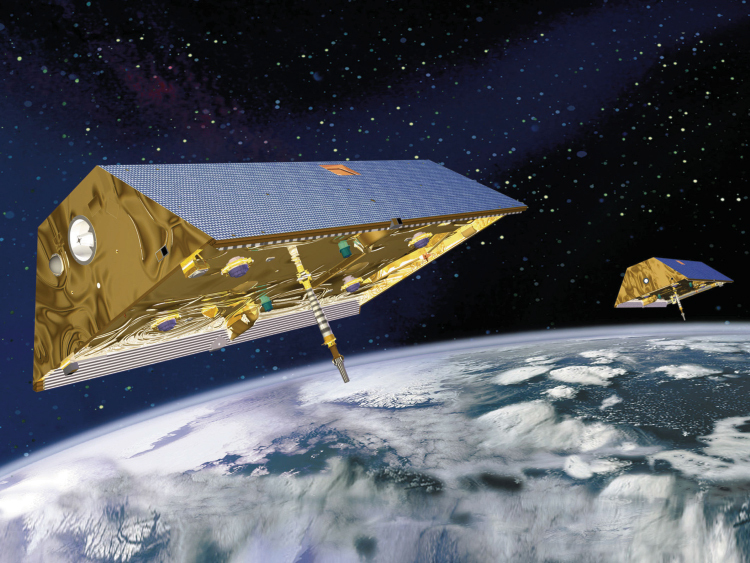 Since 2002, GRACE has relied on twin satellites that complete a full scan of the Earth each month, sending back some of the best data on the variations in the planet’s gravity fields. The program identifies the spots around the world where groundwater is disappearing or recovering. GRACE data has its limits, however. Though its overall observations are pretty consistent with ground-based findings, gravitational data gets less accurate as the area examined gets smaller, typically below 150,000 square kilometers (58,000 square miles), or about the size of Illinois. Most aquifers are far smaller than that. Since GRACE only streams monthly data, scientists also have to combine it with real-time measurements to extend their observations to the present. But the efforts to use satellite technology to study the world’s water are gaining in following. When GRACE first launched in 2002, Famiglietti and Rodell were the only two hydrologists to work on the data. Today there are tens to hundreds of hydrologists using the measurements, and NASA has extended the GRACE mission beyond the originally planned five years. Meanwhile, a GRACE follow-up mission will be launched in 2017. The European Space Agency (ESA) has its own water observation programs. Its Gravity field and steady-state Ocean Circulation Explorer mission (GOCE) is tracing ocean circulation and sea levels, and ESA’s TIGER initiative monitors water from space to facilitate water management in Africa. For people watching the videos — independent of the articles — we need better explanation. And these videos need to be replicated across countries, so that people understand the seriousness of the issue. We will be happy to host them on the home page of water on our global developmental portal.